The Coalition for Court Access was created by Supreme Court order on May 17, 2016 to provide a focused and comprehensive organizational structure for Indiana’s civil legal aid programs. The twenty-one-member Coalition will coordinate all Supreme Court related programs designed to provide civil legal aid to those with limited financial resources. The Coalition includes judges, law school representatives, civil legal aid and pro bono providers, and Indiana State Bar Association and Foundation members. The Indiana Bar Foundation serves as the fiscal and administrative agent for the Coalition. 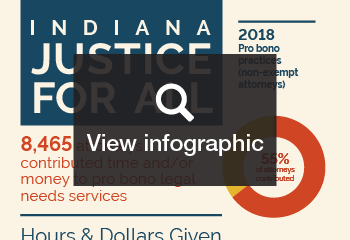 This infographic [Text version] details self-reported pro bono contributions for calendar year 2017. Nearly 8,500 attorneys contributed time or money to those in need and donated close to $1.9 million to legal service groups.